​Kitchens are high traffic areas for most homes. Renovation of a kitchen usually increases the value of the home. Our contractors can bring a new experience to the home. An entirely new kitchen was designed and built for this busy family. Modernized, tiled, hardwood - a complete redo. This kitchen and eating area was made for comfortable family living. This active space is warmed with wood and clean design. Islands offer seating and a place to eat, play, and mingle. 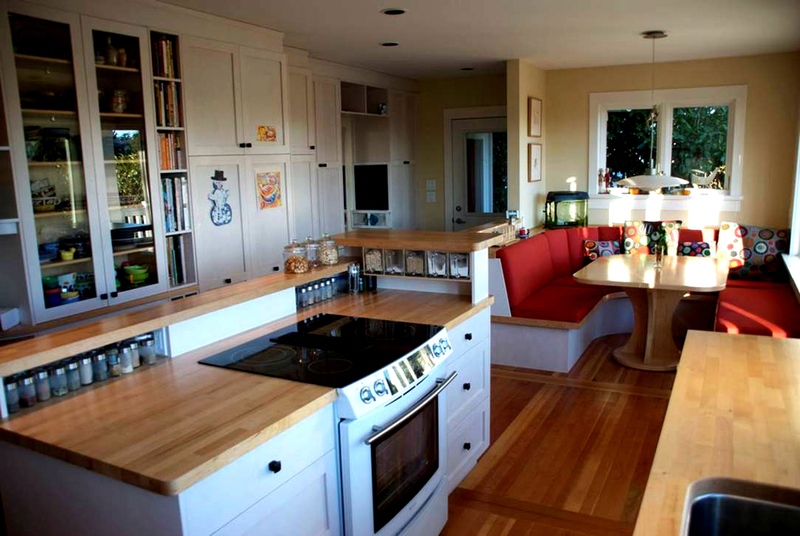 During this entire kitchen reno, such an island was added. A hub of activity means opening the flow between the kitchen, dining, and living rooms areas. Lack of natural light made this long and narrow kitchen dark. A cool lighting idea brought light to the situation. Updating this entire kitchen created a modern space, which garnered a higher rental price for this suite. Creating an open space design meant more natural light with bigger windows and open floor plan. It's one of the most important spaces in your home. It's a hub for families' daily lives. Not just a place to cook, but a place to work, relax, and entertain. From ultra modern kitchens, to French farmhouse kitchens, we have the experience that counts. If you are considering remodeling your kitchen, let us put our experience to work for you.